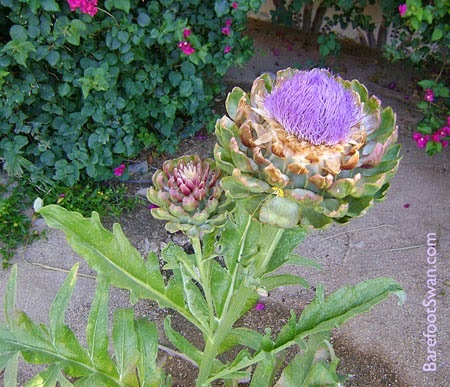 This artichoke plant is growing in a neighbor's front yard. We've been keeping an eye on it as we pass by on our morning walks. 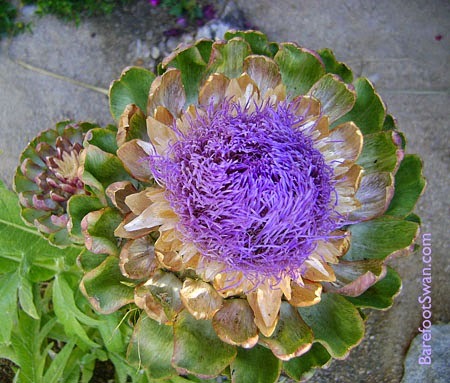 Recently it bloomed, and the flower is beautiful. 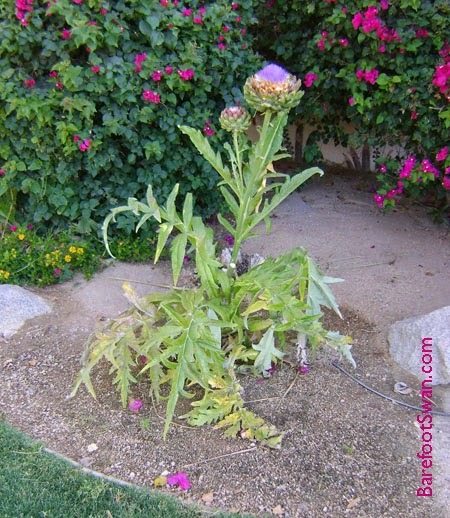 The smaller flower on the left is what you might buy in the grocery store, and cook up for dinner. "These things are just plain annoying. After all the trouble you go to, you get about as much actual 'food' out of eating an artichoke as you would from licking 30 or 40 postage stamps. Have the shrimp cocktail instead." I was taking advantage of the cool morning weather to do some weeding and clean up in the front yard. As I grabbed a handful of dead leaves from under a cactus, I felt something move in my gloved hand. Glancing down I saw I was holding what looked like the most ginormous cockroach in the world. As it lumbered off, I saw it wasn't a cockroach at all. It was a Palo Verde Root Borer beetle. These beetles are BIG - up to 3" long or more, not including the antennae. They have pinching mandibles that can give a nasty bite if handled. The thorax has spikes along the edges. This particular beetle was a dark reddish-brown but they can also be brown or black. Palo Verde Root Borers have an interesting life cycle. After mating, the female lays her eggs in the soil near a palo verde or other host tree. The eggs hatch and the larva burrows into the roots of the nearby tree where it begins eating. Over the next 2-4 years, the creamy yellow-white larva will continue feeding underground on the roots of the tree, and then pupate. The adult beetles normally hatch out after summer rains (we had a brief shower on Wednesday). They are clumsy fliers and may travel from their hatching area in search of a mate. Adults only live for about a month above ground. During this time they do not eat, in spite of the impressive jaws. Those chompers are used for mating and fighting. The beetle will die soon after mating. 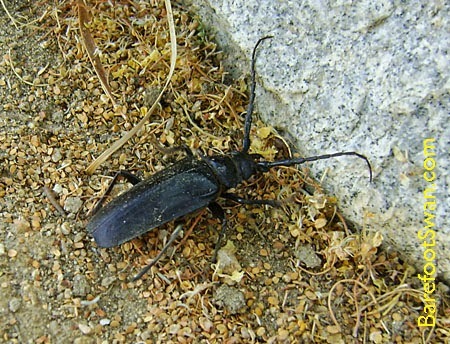 In addition to Palo Verde trees, the Palo Verde Root Borer may also feed on olive trees, some cottonwoods, and citrus in some areas. These beetles should not be a threat to healthy trees, which can outgrow any damage the larvae may cause. The best defense is to make sure your trees are healthy by providing adequate water, and fertilizer as needed. You can also turn off exterior lights to avoid attracting adult insects. 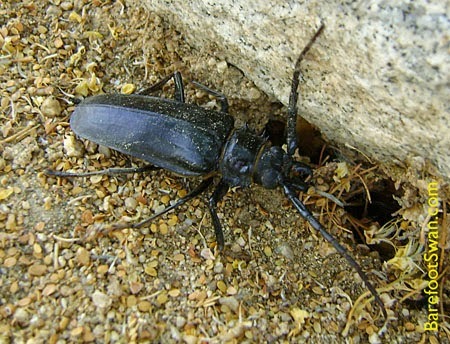 Although they are formidable-looking, Palo Verde Root Borer beetles are eaten by roadrunners, coyotes and owls. "When a blind beetle crawls over the surface of the globe, he doesn't realize that the track he has covered is curved. I was lucky enough to have spotted it." We had a surprise rain shower roll through parts of our desert yesterday afternoon. Dark clouds, grumbling thunder and some lightning flashes. We actually had a pretty good downpour for about 15 minutes. Flash flood warnings issued were issued for some nearby areas. The rain brought some welcome cooler temperatures. We've already been over 100º a couple of times this year. Normally it would be in the 90's now. If you Google "recipe peach lemon", you get lots of hits for Peach Lemonade. Some recipes have complicated steps, others have a loads of sugar. 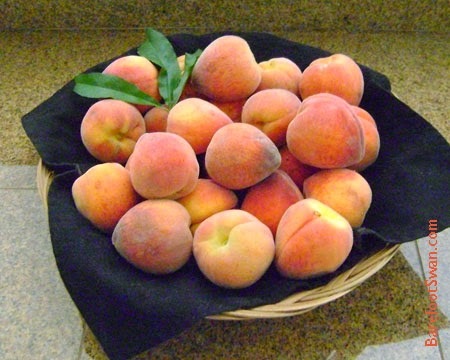 We found a simple recipe and modified it for our own super-sweet, freshly picked peaches. In a medium saucepan, stir together 2 c. water and 1/2 c. sugar*. Add 2 large peaches sliced and mash everything together with a potato masher. Bring to a boil, then cover and reduce heat to a simmer. Cook until peaches are tender, about 5-6 minutes. Cool, then strain the peach juices into a bowl. Save the peach pulp for another use (pie, muffins, etc.). When the peach juice is cooled, pour it into a large pitcher and add 3/4 c. lemon juice and 1 more c. of water*. Stir and serve over ice in a tall glass. 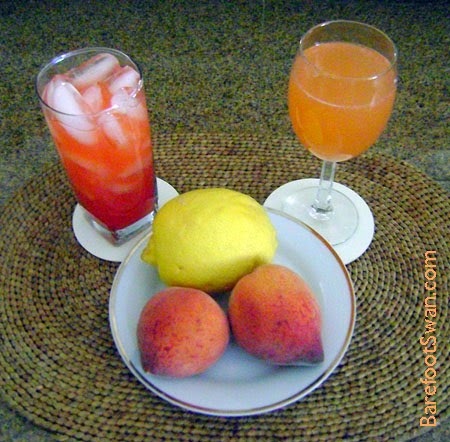 1 part Peach Lemonade and 1 part Moscato or other sparkling wine. -- The original recipe calls for 1 cup of sugar. 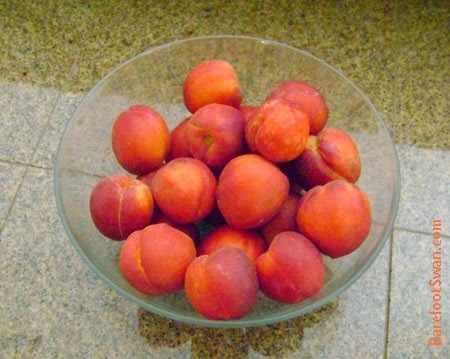 Our peaches were already very sweet, so we cut the sugar in half and let the peach flavor stand out. -- We reduced the amount of water added in the final step, from 2 cups to 1 cup. You can always add more water if you want depending on your peaches, lemons, and personal taste. "Life is better than death, I believe, if only because it is less boring, and because it has fresh peaches in it." 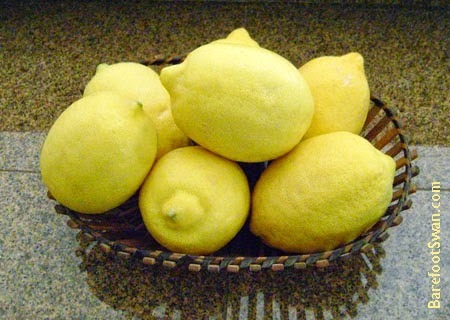 For the last few weeks we have been enjoying fresh lemons, peaches and nectarines from our fruit trees. The House Finches REALLY love the peaches and nectarines too. We have tried passive methods to discourage them - hanging shiny reflective CD's. draping metallic holiday garland through the branches. We finally decided to compromise and let the birds have the fruit in the uppermost branches. We take the fruit on the lower branches where it's easier for us to reach. There is plenty of fruit, so everyone is happy. There is no comparison between store-bought fruit and home grown. Store-bought has been engineered to look pretty and to transport without bruising or other damage. These peaches and nectarines are so juicy there is no way they could be picked and transported in a truck. "A table, a chair, a bowl of fruit and a violin: what else does a man need to be happy?"